RayTalk for Hostile Enviroments picks up all those outdoor installations so-called "to the limit", but that of necessity they must be implemented with the purpose to be able to guarantee a series of services in every type of situation, even those more critical. LThe Photo Gallery at the side, shows in fact an important sequence of success installations that has foreseen very often the integration of the RayTalk Wireless solutions with other technologies like the photovoltaic power supply, the IP videosurveillance, the automotive, the mechanics; founding itself on the deep study of the intrinsic criticalities and the reproduction in the laboratory or on the field of the more hostile climatic and environmental conditions. 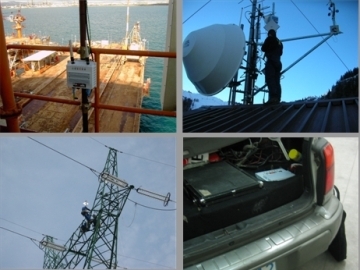 The elevated care in the choice of the components and the equipments and the antennas housing, the reliability of the wireless products (in addition planned for the outdoor) and the flexibility of the solutions engineered by the RayTalk R&D ,have always guaranteed to our clients to get, in every installation case, the winning solution with the maximum one of the performances. Please download the attached Photo Gallery.